Today, people who work in the mining industry rely on air compressors and other complex equipment. Modern mining equipment is new, but mining has existed since prehistoric times. Ancient people used intriguing equipment to extract materials from mines. This equipment was as simple as fire and as complex as pumps, aqueducts, and water wheels. Much of this equipment persisted for many years. As time passed, however, mining equipment became safer and more advanced. Learning more about mining equipment throughout history can help us appreciate the modern mining equipment we use today. Historians don’t know everything about prehistoric mining, but they do know that people used advanced tools and methods. For example, archaeologists recently discovered a 12,000-year-old mine in Peru. At the site, they found more than 1,000 hammers. Workers used the hammers to uncover iron oxide, which they used to die cloth. In North America, archaeologists discovered one prehistoric copper mine near Lake Superior. At the mine site, archaeologists found hammering stones that the miners used to create copper tools. To remove the rock in their gold mines, ancient Egyptians used a dangerous method called fire-setting. This method takes very little equipment: miners break down the rock by heating it with fire. This method wasn’t exclusive to ancient Egypt, though. Miners in Eurasia and Africa continued to use this method until the 20th century. Like other technology in ancient Rome, ancient Roman mining equipment was quite advanced. One of the most admirable mining methods was the use of aqueducts. Water flowed through the aqueducts, removing rock debris and exposing the precious metals beneath. Often, miners needed to remove groundwater to access the mine. The miners removed the water with equipment such as reverse overshot water wheels. These wheels had built-in boxes around the diameter. As the wheel turned, water flowed into the wheel’s boxes, and then exited into a channel on the other side. Like Ancient Roman miners, medieval European miners harnessed water power to complete their work. They used water wheels to power bellows that ventilated the mines. They even used water wheels as part of the process of crushing ore. Instead of fire, many miners used black powder to dislodge the rock. This blasting method proved to be faster and more effective than fire-setting. In addition, these miners used pumps to remove excess water. These pumps were sometimes mechanical and were sometimes operated by animals. Despite some advancement in mining equipment in this time period, other equipment was crude and even dangerous. For example, to lower miners down into the mine, some mines used an ore bucket that was large enough for just one person to stand inside. Other miners would stand on the bucket’s rim to catch a ride into the mine. Fortunately, other mines used cages on top of platforms to lower miners to the depths of the mine. Commercial mining wasn’t the only type of mining in this time period. During the gold rush, miners used a variety of rudimentary equipment to mine for gold. Most used shovels and picks to dislodge the gold from rocks. They also used pans and bowls to collect the gold from streams. A piece of equipment called the rocker helped miners filter the gold from the other rocks. Miners poured what they had collected onto a screen on the top of the rocker. The heavier metals fell through the screen and into a catch basin below. The miners could then sort through the materials to pick out the gold. Today, mining equipment is designed for both efficiency and safety. 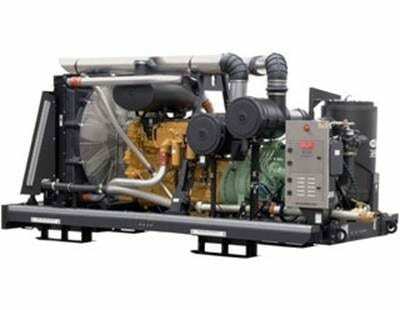 One of the most important pieces of modern mining equipment is the industrial air compressor. An air compressor supplies power by releasing compressed air. In a mine, it powers the mine’s ventilation system as well as the miners’ electric tools and machinery. Along with air compressors, various types of advanced equipment are crucial during every stage of the mining process. Miners use drills, bulldozers, and even explosives to excavate the mine. If the mine is located underground, miners descend on lifts and move from place to place on trams. They also use the lifts and trams to move tools and equipment. As soon as miners remove material from the mine, they no longer use pans, bowls, or rockers. The material is processed through a mill. High-tech machinery like crushers and reactors pound and grind the materials to extract the precious metals. If you work in the mining industry, you need equipment that’s well-built, tested, and proven to perform up to standard. If you need an industrial air compressor for your mining operation, count on Compressor-Pump & Service. We carry many air compressor makes and models from leading brands. We’ll help you find the right air compressor for your mining operation.